At a time where some schools are having trouble attracting athletes to play high school sports in the region, Bedford High School continues to be strong, fresh off an incredibly successful winter. BHS Athletic Director Corey Parker reports 491 students attempting to play spring sports, a number that’s 50 higher than a year ago. Even the recent Nor’easters weren’t about to deter these Bulldogs. The athletes have grown proactive, too, in their adjustment to the climate and the surroundings. 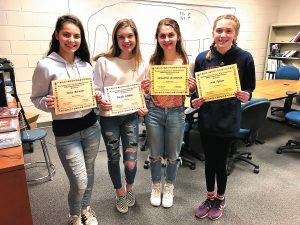 “Other programs make the best of their situations (softball/baseball mainly in the gym) and the lacrosse and track teams all brought shovels to assist in the snow removal process to get onto the track and turf,” added Parker. Lacrosse scrimmaged on the turf this week, and the tennis teams have practiced on the outdoor courts, compared to a year go when there was a foot of snow on April 1. The turf field has grown into such an advantage for athletic high school programs in New England, not just for games but for a safe, ready-to-go practice surface for multiple sports. And so it is on to the future, with opening dates set for April 2 in tennis, April 9 in lacrosse and softball and April 10 in baseball. Coming next week, we will preview the Bedford High sports prognosis for the upcoming seasons. Southern New Hampshire University sophomore Brooke Barrett of Bedford continues her strong spring on the golf course for the Penmen. At 271 in the Sunoco Campbell Oil Classic hosted by UNC-Pembroke, Barrett was the second-best SNHU finisher in the event, helping the team to an 11th place overall. A couple of other Bishop Guertin alums from Bedford continue to help the Saint Michael’s College men’s lacrosse team. 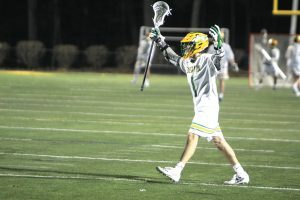 Johnny Karanasios had a goal while senior Jake Sonberg had four saves to earn the win in a recent 12-3 triumph over Post University.